Cardiff Blues' tackling will have to be up to the mark against Harlequins' Wales star Jamie Roberts in their European Challenge Cup away match on Sunday, says head coach Danny Wilson. The Cambridge University medical student, 29, left Blues for Racing 92 in 2013 and joined Quins this season. He was preparing for the Varsity match when Quins posted a bonus-point win at Cardiff Arms Park in November. "If you're playing against Jamie, you make your tackles," said Wilson. Roberts was British and Irish Lions man of the series in their 2-1 Test defeat by South Africa in 2009. The 6ft 4in, 17st 4lb centre also starred as the Lions beat Australia 2-1 in 2013 in a career that has seen him win 74 Wales caps. "It'll be great for the players to shake hands and catch up with him before and after the game, but during the game it's business as usual." Quins also recruited former Ospreys and Wales tight-head prop Adam Jones from Blues before the 2015-16 campaign. Wilson added: "Our boys will be extremely motivated with a few links there, Adam Jones as well from last year." Harlequins have four bonus-point wins and need only a point from the encounter at the Stoop to top the group. They took the extra point in the last minute at the Arms Park, with a try from Danny Care thwarting Blues' hopes of a dramatic late win. "It's obviously a huge challenge to go to Harlequins and get a win in front of their home crowd, but the boys want to put right the performance at home against a Harlequins side that deserved the win," said Wilson. "Since then we've improved out performances with four wins out of five." Blues had a weekend off before the match with the postponement of their fixture against Munster, while Harlequins inflicted a first Premiership defeat of the season on Saracens. Wilson believes the the break will have benefited his side and they will travel "with confidence that we've played some good rugby to get the results we've had recently". 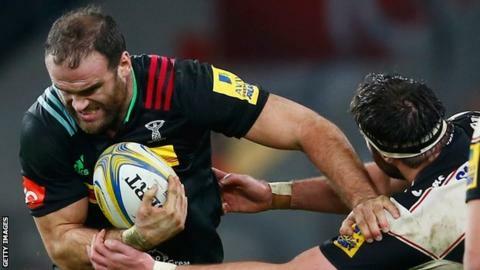 He added: "If we can perform to that level, we can cause Harlequins a headache." Wales captain Sam Warburton, fellow flanker Ellis Jenkins and Wales full-back-fly-half Gareth Anscombe could all return from injury for Blues.